Night vision goggles and accessories! We have digital, thermal, and white phosphor night vision, plus rifle scopes with night vision. You want night vision? Get a monocular, night vision binoculars and optics add-ons. We offer Generation 1 through Generation 4 night vision technology, the same items used by law enforcement, military, and security personnel. A compact night vision monocular is perfect for a hunter in need of a small, powerful, and cost-effective night vision option. Larger night vision binoculars are ideal for long range surveillance and are available with multiple image intensifier options. Many of our products are adjustable for elevation and windage, as well as waterproof and submersible. Many of the GrabAGun night vision products are attachable to a scope or helmet and useful as hand-held device, designed to function as multipurpose products that can be easily and quickly switched between tasks. 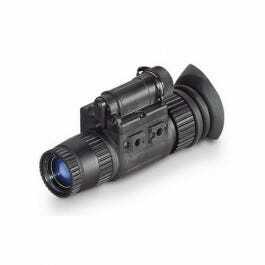 Choose from an array of night vision scopes, lenses, clip-ons and accessories like helmet attachments for the optimal nighttime experience from the best night vision manufacturers like American Technology Network, Armasight Night Vision, and Bushnell Night Vision, as well as many other top night vision brands. Night vision equipment used to be difficult to find. It was exclusive and mostly used by the military. Civilians rarely possessed anything like a night vision scope, making it difficult to hunt nocturnal game. Today, night vision gear is readily available and easy to find. From Generation 1 to Generation 3, you can find the scopes and goggles you need for each specific use. They range in price and effectiveness, so let’s review your options and address the basics of commercial night vision devices. There are three categories by which we group night vision gear. There’s night vision gear that you wear, night vision gear that you carry, and night vision gear that you mount on your firearm. You can wear or carry goggles, monoculars, or binoculars, but weight distribution is critical. You want to aim for long-term comfort and ease because overnight hunting is a strenuous task. It takes a toll on your body and your sight. Keep your gear light and close to your face for increased balance and less noise. Long binoculars hanging around your neck, swinging while you walk, could be too noisy for hunting at night. While wearing a helmet isn’t the most comfortable solution, it often offers the most stability. Make sure your helmet mounts are snug, so the forward weight is easy to manage. Also, keep your chin or harness straps tight. You may also find that the higher-priced night vision goggles have helmet mounts that flip up out of the way when you’re not using them, which is a convenient feature when your environment is rapidly changing. You can also find helmet mounts with good padding that are more comfortable than the less expensive ones. You may spend a little bit more money for your comfort, but it’s well worth it, especially when hunting in the dark. Another way to see at night is firearm-mounted scopes. You can find stand-alone night vision optics, rear-mount optics, or front-mount optics. You have to remove your day optic to use stand-alone optics, meaning your gun needs to be a dedicated night hunting platform unless you want to change out the scope regularly. Stand-alone optics are usually big, so it’s not easy to switch them a lot. Rear-mount optics can be used in conjunction with day optics, so you don’t have to fiddle with toggling back and forth all the time but be aware that you may need a special coupling bracket for any magnified optics. It can also be difficult to shoot this way because the loss of eye relief is significant and not comfortable. Sometimes you can eliminate the glow of night vision scopes on the face, but eyecups aren’t very comfortable, and in humid weather, they may cause fogging problems. Not to mention, all night vision devices glow very brightly at long range, no matter what you do to try to stop it. Most people’s preference for firearm-mounted night vision scopes are mounted in front of the day scope. Zero isn’t affected as it is with the others, and you don’t have to adjust your normal head position on the gun. The bad thing about front-mounted night vision scopes is that they are pricey, and the added weight on the front of the gun makes it difficult to hold. An old option for firearm-mounted night vision is a piggyback mount. They have significant zero-retention problems though and are quickly being replaced by the front-mounted variations. Many of the same tools you mount on your helmet you can simply carry in your hand. It can be more comfortable than a helmet, but it adds weight to different areas of your body you’re not used to, and it’s just another thing to hold in your hand when you want to use it. However, if you’re merely testing out hunting at night or you don’t do it a lot, this may be the best option. After all, sometimes hunting at night should be about the fun and not about the results. Hunting at night gives you a certain advantage because many people prefer not to hunt at night. Only if you’re a serious huntsman do you consider journeying out in the dark to catch elusive beasts. Night vision also comes in handy if you’re hunting with others. It illuminates the night and allows you to find other members of your party. Especially if someone gets lost, it’s an invaluable tool to recover those wanderers. Which Night Vision Device is the Best for You? Most people can afford night vision today. There are many affordable options, so don’t shy away from giving something in your budget a try. It’s an irreplaceable experience to have eyes in the night when all of the night-dwelling creatures are out.